The 'youngest' member of the Kitsune pantheon. After a several year-long 'apprenticeship' under Inari the already divine-blessed 'Yume' grew to be a full fledged deity with her own followers, temples and such. It is said that Yume is the one who defeated the First Nogitsune, protecting the Kitsune Realm from further corruption. Over the course of the years the honored-9-tail developed two aspects of hers, one being a 'nightmare of her foes' the other 'dream of her kin' which may explain her a bit bi-polar personality (depending on the time of day that is). 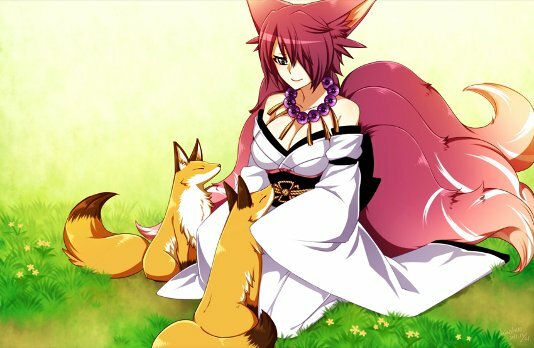 As it is the case with every kitsune… Yume's appearance can match her current whim but the goddess' favorite ones include either one of a young, serene woman of Rokugan descent clad in white robes (sometimes with a hint of her kitsune traits here and there) or a great 9-tail fox with a blazing fox-fire aura around herself. 1 Doomcape Exploration - a mishap... or two 02/16/2013 Observed her ditzy daughter through her divine senses-augmenting prism together with Ying, discussed matters related to her progeny and few … oozes (those being Ambrosia and Aegis with the ice empress before taking a bit of breather in the new ice castle of her companion. 2 Magic in my belly~ 03/26/2013 Spent time to get to know one of her daughter's nogitsune servants… as well as properly scare her to know what she is in for now. 3 Collaboration. 09/21/2013 It is quite likely that Gonvirn ended up being turned into a tiny fennec-fox by Yume for an affront to her name, imagined or not. 4 There's ... a forge in my belly ?! 09/27/2013 Kimonto's apparently bottomless stomach… proved to be a direct result of her eating the FIRST orb of divine-fire of Yume's while she was merely an infant. Shortly thereafter Yume hid the blade of her's, 'Purity' (and the personality inhabiting it 'Cause') inside Kimonto's belly. All in all such happening resulted in her momentary losing the majority of her divine power, forcing her to resort to borrowing some more from Inari for the time's being. 5 Temple of Events. 09/30/2013 Asked her daughters, Miyu and Azusa to clear up one of her temples of living dead if not more.